A few motorists reportedly honked, while others appeared generally indifferent. Cyclists say the best use of space is one that incorporates all road users, but unfortunately, motor vehicles are still given the greater consideration with broader lanes that allow for fast speeds. Some motorists behave as if there are actually two lanes going each direction on the bridge, effectively squeezing cyclists out of any sliver of space they might have had before. Cyclists are now demanding that the City only install a bike lane, but a protected bike lane at that, one that creates a permanent barrier such as curbs or posts to keep cars out of the lane cyclists are using. Too many drivers are still ignoring cyclists, who often fear not just serious injuries but also potentially death. 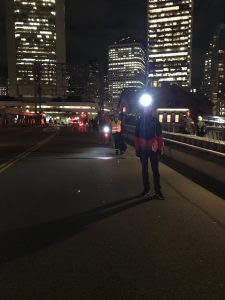 Boston bike attorney Andrew Fischer, a long-time cyclist and cycling advocate, said the fact Bostonians felt compelled to take this into their own hands showed the city has been unable to keep pace with the demand for safer cycling infrastructure. The “people’s bike lane” was drawn just a few blocks from the Bikeattorney.com office at the Law Office of Jeffrey S. Glassman. Fischer expressed hope that the city will soon make the Congress Street Bridge “people’s” bike lane a permanent bike lane. “Bicycle lanes not only increase safety, they improve traffic flow and allow new cyclists to feel comfortable riding in urban streets,” Fischer said. MGL c. 90 s. 14 spells out rules for motor vehicles sharing the road with bicycles and others. The statute in part reads that no driver who overtakes and passes a cyclist traveling in the same direction may not make a right turn at an intersection or driveway unless the turn can be made at a safe distance from the cyclist at a speed that is both proper and reasonable. Further, when turning left, not just onto a street, built onto any alley or intersection or private road or driveway, motorists must yield the right-of-way to any vehicle approaching from the opposite direction of travel (including a bicycle on the right of other approaching vehicles). It’s not considered a defense for the driver who causes a bicycle crash that the cyclist was traveling to the right of traffic. MGL c. 89 s.2 states that drivers passing vehicles (including bicyclists) traveling in the same direction must do so at a safe distance to the left and may not return to the right unless and until they have safely cleared the overtaken vehicle. Protected bicycle lanes simplify the process and ensure both motorists and bicyclists have a safe, adequate amount of space. It’s long been established that protected bicycle lanes benefit all road users. Although a line in the pavement is better than nothing at all, protected bicycle lanes provide exponentially more comfort and safety. For instance, a 2014 study by researchers at Portland State University analyzed the use of protected bicycle lanes in five large U.S. cities. They gathered video data, conducted local surveys and collected information on bicycle trends through these corridors. In so doing, they discovered that not only was the injury risk cut in half, but ridership increased anywhere between 20 percent and 170 percent. Many of these new riders polled said they were drawn to cycling because they finally felt safer doing so. Prior to the installation of those lanes, some had unprotected bicycle lanes while others had none at all. While it’s true that cycling is on the rise everywhere, the sharp increase in those places that had protected bicycle lanes was undeniable and the connection almost assuredly causal. This is further illustrated by the fact that while overall citywide increases in bicycle ridership continues to increase, the increases in ridership on those stretches of road with protected bicycle lanes was dramatically greater. The first protected bike lane in Boston is being installed on a mile long stretch of Commonwealth Avenue, from the B.U. Bridge to Packard’s Corner. BU.edu The protection will come from granite curb barriers erected between sidewalks and street parking. It’s modeled after infrastructure in Manhattan and Montreal. The Massachusetts Department of Transportation reported the move was part of a $20 million roadway improvement project that is a collaborative effort with Boston University and the City of Boston. Although cyclists have advocated for this for well over a decade, it wasn’t until a Boston University student died on a bicycle after being struck by a car in 2012. Bicycle accidents along Comm Ave. are approximately twice the national average, according to Boston city officials. Even so, bicycle use along that corridor has risen by almost 50 percent during the morning commute and more than 130 percent during the busiest afternoon rush hour surges. Bicycle Attorney Fischer is working with a MASSBike team to obtain prosecutions of drivers who have killed or injured bicyclists in his ongoing efforts to provide safer streets for cyclists.